We have called this meeting to try and unite the efforts of religious, education, and community leaders in Monmouth County and beyond. 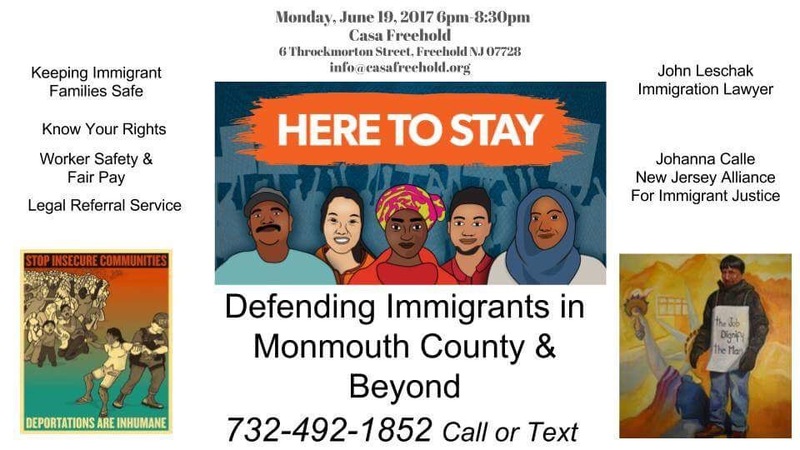 Johanna Calle, Executive Director of New Jersey Alliance for Immigrant Justice, will share her views on how we can work together with partners around New Jersey and the nation. Traditionally, schools, houses of worship, health centers, courts, and community centers such as Casa Freehold have been safe spaces in our society, respected by all. That is no longer the case. John Leschak, immigration lawyer and a strong human rights activist who volunteered at the airport during the Muslim ban, will give us the latest news on the status of immigrants and refugees.